A group of rhesus macaques gathers along the Silver River in Florida's Silver Springs State Park. Credit: the National Geographic Society. A dewy morning fog hangs over the Silver River in central Florida. Gibbering chirps resound through the riverside oaks and maples as the local colony of rhesus macaques rises to greet the day. Two anthropologists from San Diego State University sit in a canoe, awaiting the river's human visitors in order to observe one of the more unlikely and understudied human-wildlife interactions in the world. 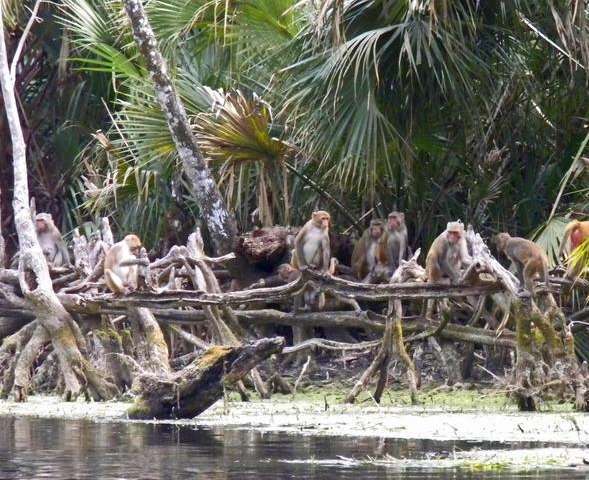 No one knows exactly how or when the monkeys, which are native to southern and southeast Asia, were introduced to the central Florida wetlands. A popular although debunked rumor says they were released after filming wrapped on 1939's Tarzan Finds a Son! Another theory has it that an early 20th-century riverboat pilot, in an effort to drum up tourism, released some monkeys on a river island—unaware that they're fair swimmers. Whatever their origin, the monkeys have lived in the region's wetland parks for decades and have adapted to this environment. They've been reported as far north as Jacksonville and as far south as Orlando. Over the years, population numbers have waxed and waned due largely to intermittent trapping efforts. Locals generally like having the monkeys around, said Tiffany Wade, a graduate student studying primatology at SDSU. "A lot of people enjoy having them as part of the park experience," she said. "They really kind of show them off to out-of-towners." However, wildlife officials have a different perspective, added Wade's mentor, SDSU anthropologist Erin Riley. "The local authorities, like the Fish and Wildlife Service, have been less thrilled with the monkeys," she said. "Their purview is to maintain a natural environment, and these animals are not natural to this area. They have concerns about the local ecological impact of these animals, and then there are also health issues if people interface and get close to them." Even in the primatology community, Florida's feral monkeys are a bit of a secret. Riley has spent years studying human-macaque interaction in Indonesia, but when a professional colleague, Eben Kirksey, suggested she might want to look at some macaques living in Silver Springs State Park (about an hour's drive south of Gainesville), she was surprised. "I thought, 'How did I not know about this? This is totally up my alley,'" Riley said. With Kirksey's help, she initially scouted the area in 2012. A year later and with funding from the National Geographic Society/Waitt Grants Program, she took a sabbatical and brought Wade along to begin studying the population in earnest. A local citizen scientist, Bob Gottschalk, had been keeping tabs on the monkeys and making preliminary observations, giving Riley and Wade some good pointers on where to find them. They started canvassing the river by kayak and canoe, counting monkeys and talking to boaters they met along the way. "For many people, it was natural that the monkeys were there because they've been there for so long," Riley said. "To them, it's kind of a natural component of the Silver River." Despite the macaques' long tenancy in the park, as of Riley and Wade's most recent expeditions, there were no signs posted letting people know about the monkeys, only generic signs warning against getting close to or feeding the wildlife. When Riley asked park officials about the lack of signage, she was told the park didn't want to advertise the monkeys or encourage visitors to come and see them. But that presents a kind of double bind, Riley explained. A lot of people are coming to the park anyway, some of whom already know about the monkeys. The absence of information only compounds the types of problems that park officials are trying to prevent, she said. One of the biggest concerns surrounding the monkeys is their population size. Nobody wants to see a nonnative species grow too big and decimate the local ecosystem. Yet estimates for the number of monkeys living in the park have varied wildly. Some of the more alarming estimates have suggested upwards of a thousand or more. Over the course of several months, Riley and Wade conducted a thorough census throughout the park and came up with a much more sober figure: 118 individuals living in four separate social groups. "If you're not trained in animal censusing, it's easy to be fooled into thinking that you're seeing more animals than there really are," Riley explained. How many monkeys live in other parts of the Florida greenway remains unclear, she added. There are likely a number of groups living beyond the Silver River that would raise the overall Florida population into the hundreds, if not more. Another prong of their study looked at how frequently visitors were feeding—"provisioning" is the scientific term—the monkeys, and conversely, how much of their diet came from eating natural foods in the environment. Riley and Wade would take to their boats each morning and visit the various macaque groups, cataloging the monkeys' menu. Native rhesus macaques are spread across a large range in Asia. In tropical locations like Thailand, the monkeys eat a lot of fleshy fruits. In more temperate environments like Pakistan, however, they tend to eat more leaves and other vegetative plant parts. Like the latter environments, Silver Springs State Park is temperate. There are few fleshy fruits to be found. Riley and Wade observed that the Silver River monkeys, like their other temperate-dwelling relatives, ate mostly leaves, buds, flowers, shoots and a type of dry fruit called a samara. Ash trees formed the cornerstone of their diet. The researchers did note one novel, local adaptation: The macaques also ate grass-like sprouts called sedges that grow in wetlands. When humans rolled down the river, Riley and Wade quietly and inconspicuously watched and recorded how many visitors interacted with the monkeys and how many gave them food. Some of the locals obviously came prepared with a bevy of snack offerings, while others would tear off a piece of hot dog or pitch the monkeys a spare apple slice. "They love fleshy fruits," Riley said. "People would sometimes throw them whole oranges and you're like, 'Watch out, don't nail them in the head!' They love peanuts. Grapes also seemed to elicit what are called 'food calls.' Really, they're excited about pretty much anything you give them." Occasionally, Riley and Wade talked to boaters after they had fed the monkeys and learned they did so primarily for two reasons. "People who fed the monkeys assumed that they were hungry," Wade said. "They thought they were helping. But they also wanted to intensify their interaction with the monkeys. They wanted to see them right up close." The researchers also noticed the monkeys seemed to have their own rule of thumb for deciding whether it was worth their time to come to the tree line in search of human handouts. After five months of observation, Riley and Wade totaled up the numbers for the monkeys' feeding behavior. The final tally? A whopping 87.5 percent of their diet came from the natural environment and a relatively paltry 12.5 percent came from provisioning. The researchers published their results this week in the journal Primates. That ratio stands in contrast to other places in the world where rhesus macaques regularly interact with humans, such as at some temple sites in India where the majority of the monkeys' food comes from humans, Riley said. The researchers did note that even though provisioned food represented only a small percentage of the monkeys' overall diet, the fleshy fruits that humans give them may be an important fallback food. When it came to interactions between macaques and humans, the researchers found that while they were frequent, most were benign: humans pointing out the monkeys or talking to them, the monkeys either ignoring them or waiting to see if an orange might come their way. Out of 611 recorded interactions, only two involved people directly handing food to a monkey. That suggests worries about the monkeys' health hazards are out of proportion to the actual risk, Riley said. The river itself acts as a hurdle to disease transmission, as the dense cypress roots all along its banks make it difficult to land a boat and explore the vegetation. "The [disease transmission] concern certainly is legitimate," she said, "but it has been, I would say, over-heightened." For Riley and Wade, their findings underscore the need for official education and outreach programs. They would like to see park officials introduce some kind of signage or brochure educating visitors about where the monkeys come from and how to safely interact with them, and they believe increasing patrols along the river would go a long way toward discouraging people from feeding the monkeys. For their part, the macaques seem to have adapted well to the Sunshine State. It will take more research to determine what kinds of ecological effects they are having throughout Florida's greenway, but so far Riley sees the situation as one of mutual benefit: The macaques receive some additional sustenance and park visitors get to enjoy seeing these remarkable animals in a wild setting. Studying this population has made one thing more difficult for Riley, though: "I've kind of joked to my friends that I don't think I can go paddling on any other rivers now because there aren't monkeys there."